Sin-Free Snacking From Scratch: De-Guilt Your Favorite Pleasures! You may have noticed a proliferation of all things coconut at the market these days: coconut water, coconut milk, coconut chips and more. If you are among those going crazy for coco, The Coconut Tool is your go-to implement. 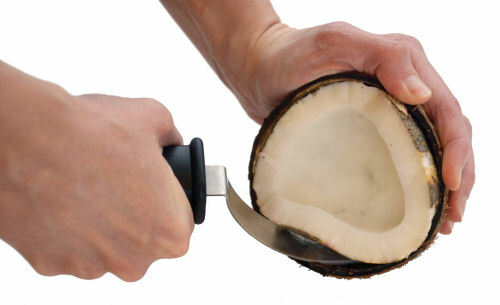 Just split the shell with a hammer, then use the curved blade with its sturdy handle to easily pry the coconut meat from its inner shell and enjoy it however suits your fancy. Available online at http://www.whisknyc.com and at Bowery Kitchen Supplies 88 Tenth Avenue, 212-376-4982. Chips have long been a favorite snack, but they’re not often considered a health food. You can easily prepare healthy chips at home with a Topchips Chips-Maker Set from Mastrad. Simply place slices of potato, sweet potato, carrot, apple, pear or mango on the chip-maker silicone trays (a mandoline food-slicer is included), put the trays in the microwave and, three to 10 minutes later, your chips will be ready to enjoy. Available online at http://www.shopmastrad.com and at Bed, Bath & Beyond (see http://www.bedbathbeyond.com for locations). There are so many frozen yogurt bars and gourmet ice cream shops in the city. They tend to be pricey, though, and they also tempt me to load up on a calorie-laden smorgasbord of my favorite toppings such as hot fudge and Heath bar crunch! Now, with a Cuisinart Frozen Yogurt, Ice Cream and Sorbet Maker, making my own homemade frozen yogurt, ice cream or sorbet is easy, economical and the ingredients can be as low calorie or decadent as I like. 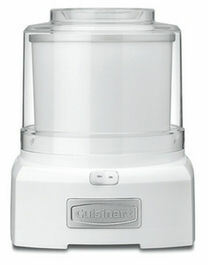 The machine is compact and sleek and makes up to 1½ quarts of frozen treats in 20 minutes or less. Refer to the recipe booklet to make Lowfat Strawberry Frozen Yogurt, Fresh Mint Ice Cream with Chocolate Cookies or whatever you please. Available online at http://www.macys.com and at Bed, Bath & Beyond (see http://www.bedbathbeyond.com for locations).